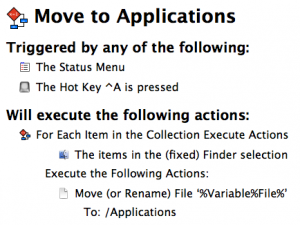 A very simple macro to move a selected file in the Finder to the Applications folder. It is triggered by ⌃-a (Ctrl-a) — which can be changed in Keyboard Maestro. I made this macro because I found that moving files to the Applications folder took too many steps. 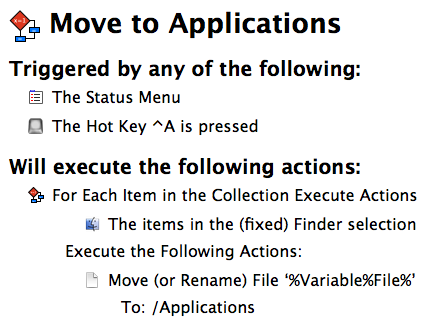 With this macro, I select the file(s) and one keystroke later, I’m done. You may want to duplicate thus macro for each folder that you regularly move files to (such as Documents, Movies, Music, Pictures, Dropbox, etc.). Special thanks to Peter Lewis for teaching me how to use the ‘%Variable%File%’ variable.